1. Position 2 racks in the upper and lower thirds of the oven and preheat to 425°. Slice the potatoes into 1/3-inch-thick fries. Place on a baking sheet, drizzle with 2 tablespoons olive oil, toss to coat, then arrange in an even layer. Bake in the upper third of the oven until crisp and golden, about 40 minutes. 2. Meanwhile, remove and discard the skin from the chicken, except for the wings. In a large bowl, beat the egg white until frothy. Add the chicken pieces and toss to coat. 3. Line a baking sheet with parchment paper. In a medium bowl, mix the bread crumbs, flour, Cajun seasoning and paprika; season with salt. Coat the chicken with the crumbs and transfer to the prepared baking sheet. In a large, heavy skillet, heat 3 tablespoons olive oil over medium-high heat. Add 4 chicken pieces and cook, turning once, until golden, about 3 minutes. Transfer to a clean baking sheet and repeat with the remaining 3 tablespoons olive oil and 4 pieces chicken. 4. On the bottom rack of the oven, bake the chicken until cooked through and crisp, about 22 minutes. 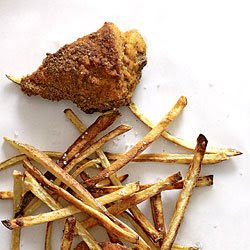 Season the fries with salt and serve with the chicken.